Welcome to generation luxe - a new collection of scene-stealing shutters for discerning homes. 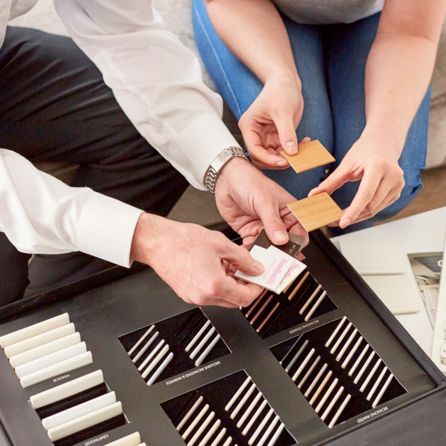 Browse our inspirational shutters gallery to view our new painted shades, natural wood stains and fabulous custom colour options. 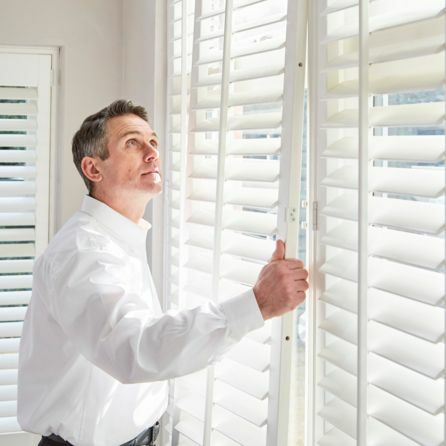 View Custom Colour shutters from the Richmond range. We’ve shutter styles to suit every type of window, and our expert advisors are here to help you achieve a superior finish. For an authentic look choose traditional full-height plantation shutters. Top and bottom sections open independently for control over light and privacy. Go continental with café-style shutters in the bottom half of your window. Transform a wide window into a stunning feature with gliding tracked shutters. We can make and fit plantation shutters to almost any size or shape of window. Ideal for classic period styling, solid shutters add a warm insulating layer. Need help picturing your new shutters? Stylist, fashion journalist and brand consultant Erica Davies transforms her nondescript new-build into a fabulous family home with sophisticated shutters. Our new collection of made-to-measure shutters offers stylish window solutions for discerning homes. Shutters are for more than just pretty French cottages and farmhouses. They actively help to insulate your windows in the colder months. In fact, research by the English Heritage and Glasgow Caledonian University shows that shutters can reduce the amount of heat lost through windows by 62%. Choose wooden shutters for a look that is timeless and elegant. Plantation shutters look equally at home in contemporary and classic interiors, and are available in a wide range of natural wood stains or painted finishes to suit your style and décor. Effortlessly stylish and extraordinarily versatile, choose from slatted or solid wooden shutters, or opt for our waterproof designs which are perfect for bathrooms and kitchens. We can make your shutters to fit any shape of window in any room of the home, and our custom colour service will match your painted shutters to virtually any shade.